It seems like I blinked and July passed by. I really feel like we just returned from our trip to San Francisco but that was over a month ago! I’m happy to say that I accomplished everything on my “July” goals list. That doesn’t always happen for me - a lot of time life gets in the way but I really tried to narrow down what was most important for me right now and I’m happy to say I completed it even though I don’t know how because the month went by so quickly. 1. Finish the nursery. Aside from moving the queen bed out and the crib in because I’m not *quite* ready to transition Madeline out of the crib yet but I’d like to finish the space aside from that swap and get art purchased and hung, the closet organized, etc. 2. Host two charity socials with Beautycounter. These are socials where the profits go to a school, church, or charity in need or to a family in need of financial assistance for adoption or medical expenses. One of the reasons I chose to partner with this company is that we really put our money where our mouth is for helping those in need. If you know someone or an organization who might benefit from this, please help me get in touch. 3. Keep working out at least five days a week and get back into the swing of meal planning. I’ve been flying by the seat of my pants all month as far as cooking goes and need to do better with planning and prepping our meals. 4. Plan a last-minute mini family vacation so that Madeline gets a few days at the beach this year. Most of our travel time for the summer went to our trip to New England and San Francisco but we still want to sneak in a quick trip with our girl during her last months as an only child. 5. Celebrate our sixth wedding anniversary! What is on your "to-do" list of goals for August? What good goals! I probably need to start doing something like this to hold myself accountable! Yay for quick beach trip. And 6 years! Man I feel like I can remember when you first got married. 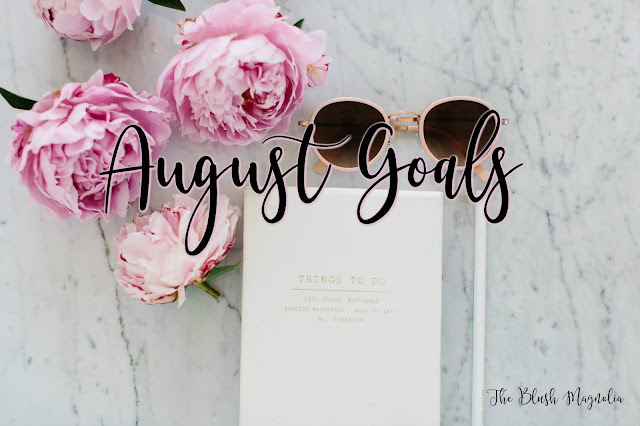 Way to go on accomplishing your July goals! That's so motivating. Happy early anniversary! So many of our friends and family got married in August! It's a good month!